To celebrate the Chinese New Year, for the next several weeks I’m going to feature different children’s books that touch upon some aspect of Chinese culture. Today I’m incredibly excited to introduce a new one I came across a couple weeks ago at my kids’ school library. 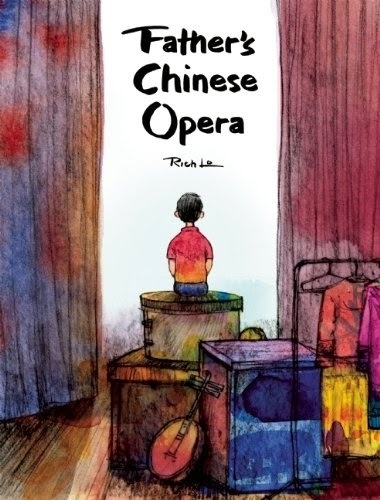 Rich Lo has written and illustrated a beautiful book titled Father’s Chinese Opera (Sky Pony Press, 2014) that tells the story of a little boy with huge determination. The librarians at my younger kids’ school ordered it for our school’s upcoming study of China. As soon as I saw it, I knew I would order it. And my first thought was that my older son, whose own father spent 7 years in a Chinese opera decades ago, would enjoy it even though he hasn’t read picture books in quite some time. But as it turned out, my younger kids have really taken to it, especially my 5 year old son. The book tells the story of a young boy whose father is the director of a Chinese opera in Hong Kong. The boy is particularly attracted to the martial arts in the opera and asks the lead choreographer to teach him the different moves. The boy assumes he will be able to join the opera as an acrobat after he learns and practices the different moves. But the lead choreographer, Gai Chui, chuckles and says it takes a lot of time and determination to be good enough to join the opera. The boy is upset he cannot join right away and runs home to his apartment. Although he doesn’t get his way at first, the boy doesn’t give up. This story has a happy ending with a good message for kids and adults alike. And the illustrations are rich and beautiful. The back of the book includes notes about Chinese opera and a lovely write-up about the author’s family and his father’s background. Highly recommended for kids of all ages.